Out of Tune is calling. A song half-heard. The murmur of a voice singing in the dark. There it is again...a few words set to an old melody filled with mystery, heartbreak and horror. 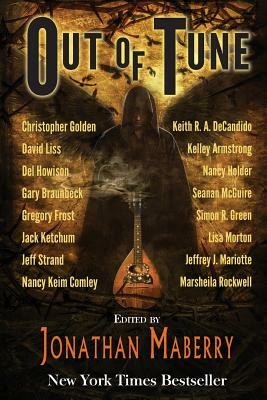 Out of Tune gathers a collection of original dark fantasy tales inspired by folk ballads. Here you'll find stories of strange creatures and strangers humans, treachery and love, murder and monsters. Out of Tune brings together some of today's most talented writers and sets them loose in that swirling darkness at the edge of town. NY Times bestselling author and editor Jonathan Maberry unleashes his own brand of dark forces with a line-up of bestsellers and award winners. Kelley Armstrong, Jack Ketchum, Simon R. Green, Seanan McGuire, Christopher Golden, David Liss, Gregory Frost, Keith R.A. DeCandido, Jeff Strand, Lisa Morton, Jeff Mariotte & Marsheila Rockwell, Nancy Holder, Del Howison, and Gary Braunbeck. With commentary on each source ballad by folklorist Nancy Keim Comley. Now get ready to dance to the music of the night.